When it comes to kids, buying tablet at times becomes heck of a job. So many factors to be taken into consideration… educational apps, parental guidance software, games, memory space, cameras (especially when every kid is a budding shutterbug!!!). Things do not stop here. Today’s kids have well researched list of features with every specs being the latest of the latest available in the market. And…no compromise. Why should they, when they have Swipe Junior tabs at their disposal. Swipe, a California originated company, is a well established name in the budget tablet market and now has extended its realm to the kid’s world. 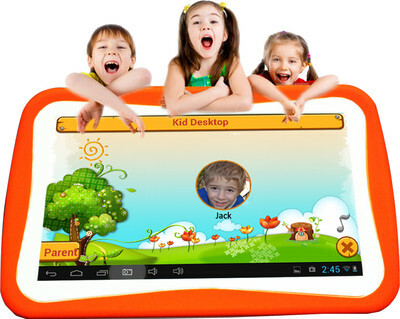 It has been in spot light for introducing tabs with the fastest OS in kids range, Android 4.1 (Jelly Bean). A 7-inch screen( 1024×600 pixels)5-point multi-touch display powered by 1.0 GHz processor and 512 MB RAM make Junior a distinguish slab in its category. It has 2 MP front camera and 0.3 MP rear camera. It’s the first tablet in India with ‘Parental Lock System’ and ‘Timer’. Parental Lock System enables the parents to block or restrict unwanted internet usage and timer keeps check on the time spent by allowing parents to set the amount of time they want their kid to be in tab’s company. Junior comes with an encasing that protect it from the usual bumps and bangs that every kids gonna give them. You know kids… they themselves bump into so many things so tabs has to be definitely protected. The interesting thing about this encasing is that it is made up of food- grade quality material making it even safe for toddlers. So do not panic when you see your tiny-miny toddler using its tab as a chewy toy.